Every now and then we get to work on a property as undeniably cool as this mid-century modern home perched above the ocean in the Pacific Palisades. With floor-to-ceiling windows—and, hello! views!—abound, we were already smitten. As soon as we set eyes on the sleek, understated finishes of the home, we were eager to play with furniture and décor that would look incredibly “Mad Men” with the architectural bones of the house. 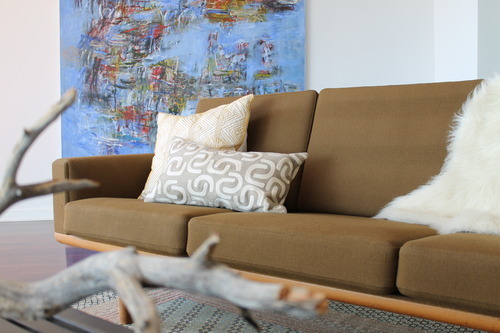 We were dying to work with the home-owner’s original art pieces and vintage Scandinavian sofa, which we were pining over. 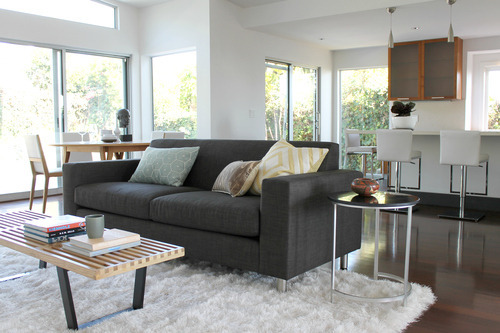 The subtle tribal patterns of the pillows on this über-MCM sofa mix up the look for an eclectic feel. 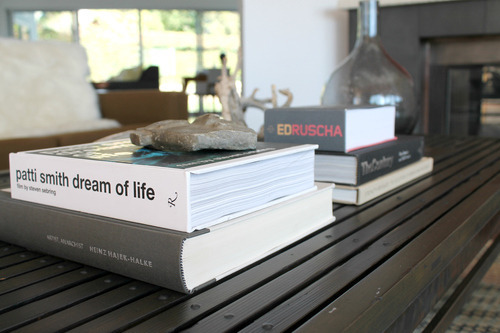 High-contrast books on the coffee table add a touch of sophistication without fail. Seeded glass and weathered branch details are a nod to the coastal locale without being too literal. 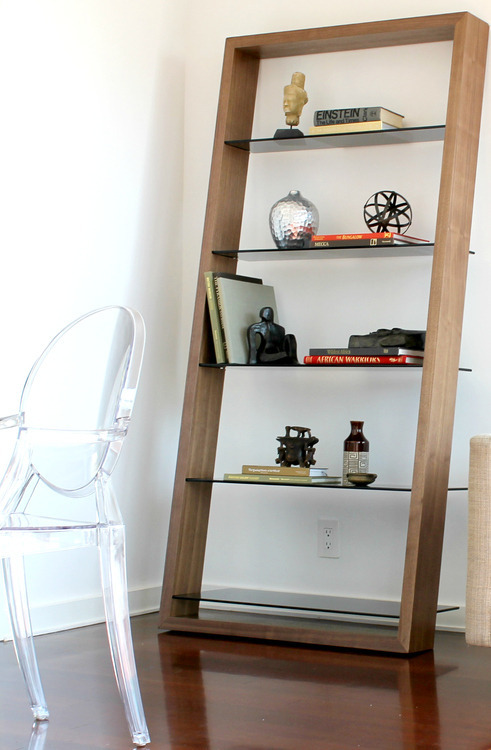 To give the office a lived-in feel, we styled a leaning bookcase with statement books and worldly accessories. A ghost chair adds plenty of style without taking up any visual space in this small room. 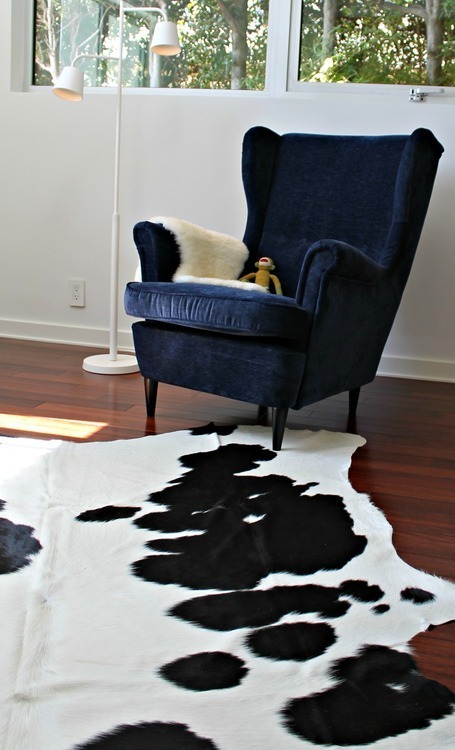 In the family room, we warmed up the cool tones and metallic finishes of the room with a plush Thom Filicia shag rug we snagged at a steal from—can you believe it?—Home Goods, for a fraction of the original price. 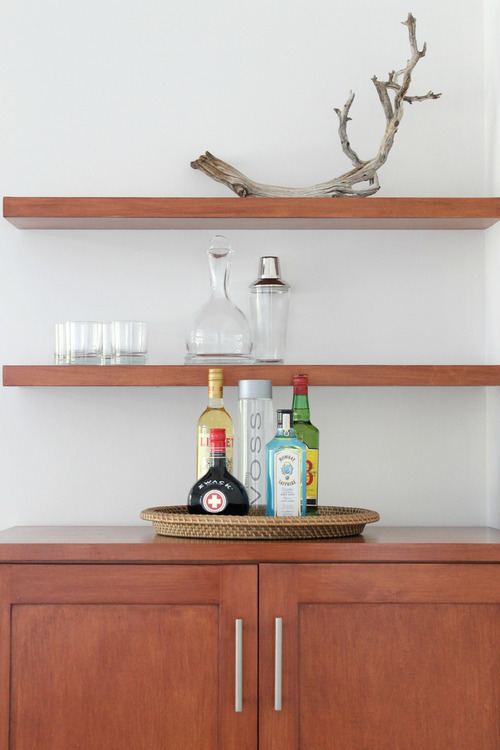 Simplicity was the key in styling this built-in bar, neatly tucked into a corner neighboring the kitchen. We corralled the bar necessities with a round woven basket and kept the rest of the accessories unified in glass for an uninterrupted look. A Manzanita branch adds a touch of drama to an otherwise understated area. 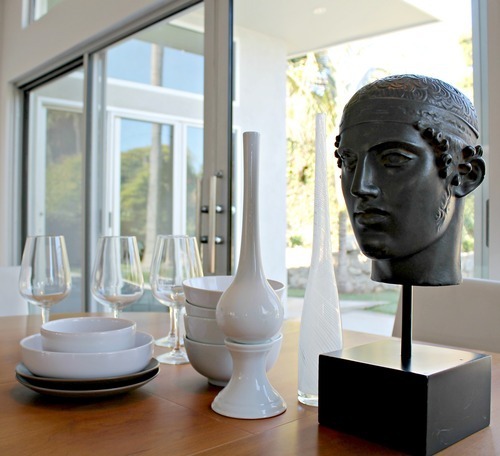 A vintage bust on a stand adds a touch of antiquity to this modern dining space. The low profile of this platform bed begged for the height and presence of this pair of frosted, fluted lamps. 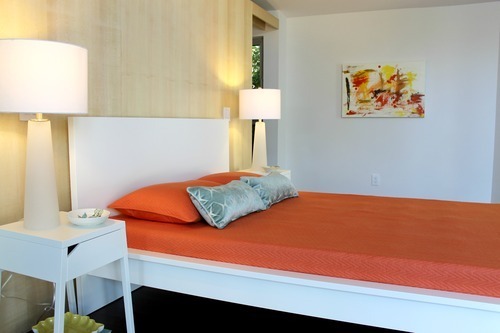 We brightened up the white palette of this room with coral and aqua bedding, colors reminiscent of Palm Beach decor. 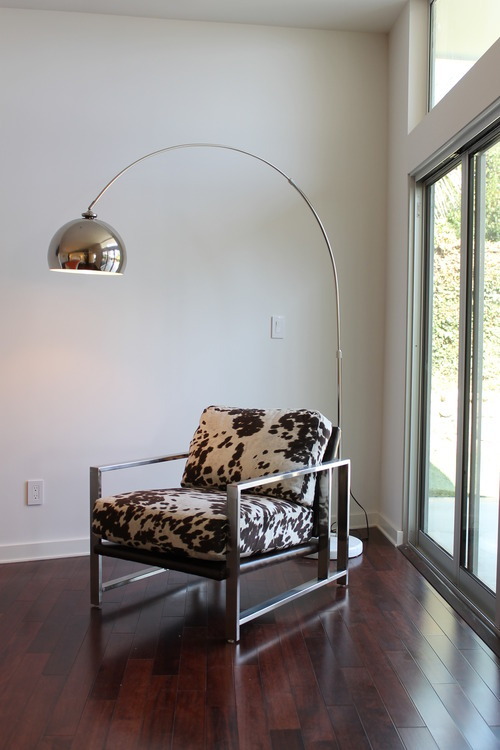 A polished chrome Arco lamp and cowhide upholstered seat infuse the otherwise feminine room with masculine energy. 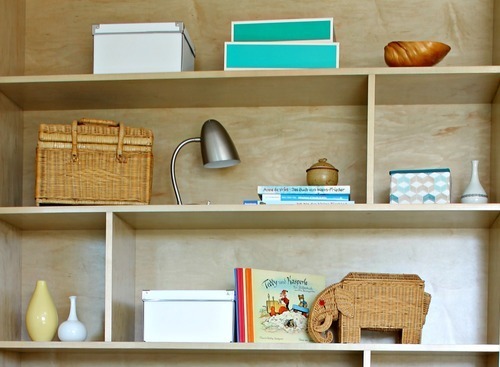 The built-ins of this baby’s room called for fresh blues and crisp white boxes to pop off the warm wood tones. A black-and-white cowhide rug grounds the room and wakes up the pastel palette.